Working on the prelude to the Dragon War has been tough. Each post ends up being far longer than I usually aim to make my posts, resulting in me often missing my target of having a new D&D related post ready every Monday. Thankfully, I’ve finished the short descriptions of lives of the heroes of the Dragon War before the war itself. I’ve been working those into the Timeline as I go. The only ones that remain to be included are Shratalanda, Tracy, Bigby, and Gorwinua. After this I have a few gaps to fill in for events prior to the Dragon War as my next goal with occasional diversions as needed. 1002BCE: Tracy the Halfling was born in Phoenix. 996BCE: Shratalanda murdered Tracy’s parents. She never discovered who killed them. The orphaned Tracy turned to burglary and pickpocketing to support herself. 990BCE: Anti-Halfling feelings in the Conclave increased. Halflings left Conclave cities in a slow trickle. 986BCE: Shratalanda delivered Bigarius to his Elven parents in the Dry Woods. He quickly took on the nickname of Bigby. 983BCE: The Humans of the Conclave blamed all the organization’s shortcomings on the other races. A few demagogues whipped the people into a fury and a pogrom broke out in Phoenix against Halflings. Businesses and homes of the little people were looted and burned. 982BCE: Halflings leave the Conclave cities en masse to found two new settlements, Crafterton for the Halflings of Western Cimmeria and Nomingburg for those of the east. 980BCE: Continuing their paranoid racism, the Conclave sent an army composed of Humans to march on Nomingburg. The Halflings fought back with hit and run ambushes as the army approached. When the army reached Nomingburg, the Halflings armed themselves and prepared for a set piece battle. On the morning of the battle, both sides found all their weapons missing. Tracy had stolen them. She vowed to return the weapons if both sides agreed to a lasting peace and to only use their weapons for good. The peace was accepted and the Humans went home. 979BCE: Tracy became the matron of the Halfling race, guiding the major cities of Nomingburg and Crafteron on their paths as well as the villages and caravans sprinkled throughout Cimmeria. Her guidance shaped Crafterton into the technomaturgical wonder it is today. 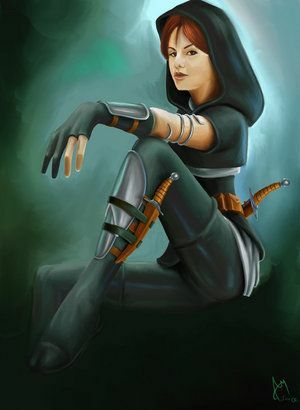 Sadly, her desire for Nomingburg to become a haven for trained survivalists backfired as it became a den of assassins, killers, and thieves after her death. 977BCE: Bigby began his apprenticeship to a magical tutor. 970BCE: Bigby rapidly learned all his tutor could teach him and moved on to another tutor. He invented his own style of casting spells, incorporating the particular techniques of each of his mentors into his own as he saw fit. 927BCE: Gorwinua was born in a small Orc village north of the Shacklack Desert. 926BCE: Bigby decided he was down apprenticeships. At a startingly young age he began defending the Dry Woods. Using his hand magic he fended off an incursion of Orcs into the woods. 924BCE: Bigby defeated a group of Gnolls that attacked the Dry Woods. 921BCE: A group of Human loggers from the Conclave cut too deep into the Dry Woods. Bigby drove them off. 919BCE: The loggers returned to the Dry Woods. Instead of driving them off Bigby cast a spell with Shratalanda’s help that caused the Dry Woods to grow beyond the loggers ability to cut it. The forest advanced southward at a slow and steady pace despite a large logging industry owned by the Humans of the Conclave. Due to this spell the Dry Woods would eventually be renamed Bigby’s Forest. 912BCE: Gorwinua turned 15, the age of adulthood for Orcs. Shratalanda, disguised as the storyteller of Gorwinua’s tribe, trained the young Orc in the art of inflaming people’s passions and spirits. Gorwinua left her village to go questing with other Orc warriors in the Shacklack. 910BCE: Gorwinua had a string of successful quests into the desert. 909BCE: Gorwinua broke her leg. Her questing group brought her home, but died when they returned to the desert without her. 908BCE: Gorwinua gathered warriors from many different Orc tribes and returned to the cave where her companions had died. The large band succeeded in slaying the cave troll only thanks to Gorwinua’s magical song which focused and unified their efforts against the huge troll. 907BCE: Gorwinua’s desert raiding band grew in size as more and more Orcs joined her rather than quest on their own. Questing glory was shared among the whole Orc race. 906BCE: Bavastatner saw the large Orc band that looked suspiciously like the armies that the dragons had forbidden. Bavastatner told Gorwinua to disband the army, but she refused. Bavastatner burnt and scattered the Orcs and Gorwinua escaped. 905BCE: Gorwinua organizes a true Orc army in secret with commanders, discipline, and battle formations. She planned to use the army against the dragons themselves when the time came. 904BCE: Bavastatner and the other blue dragons chased Gorwinua and her army down, but she evaded them at every turn as her army grew.